Dec 18, 2018 - We were on WGN morning news! Oct 22, 2018 - Death Wish! Ethereal Chocolate! Death Wish Ethereal Chocolate Bar! We're changing the chocolate game — later this year, we're releasing caffeinated chocolate bars. We're working with Death Wish to make a chocolate bar that has an imprinted skull and crossbones, and includes Death Wish Coffee, of course. 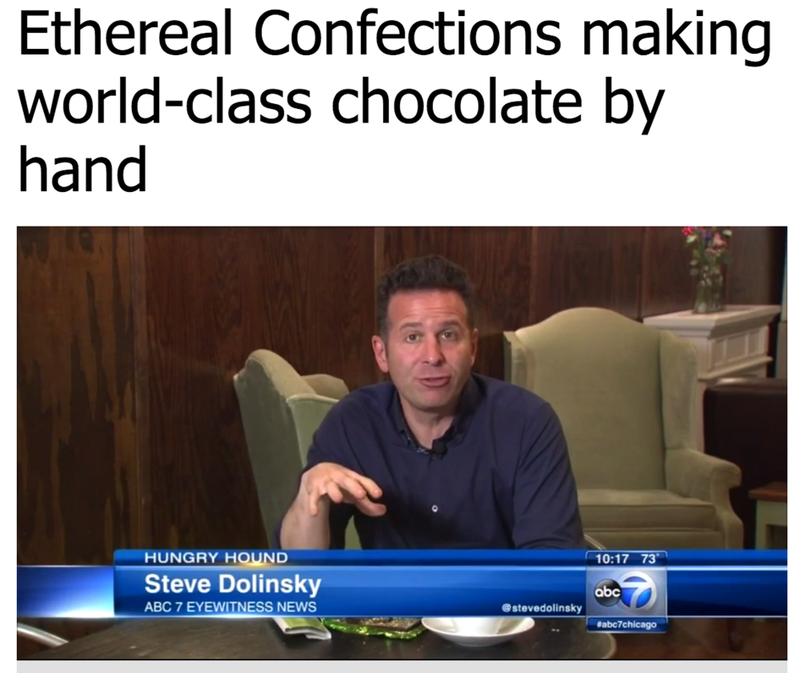 Apr 29, 2018 - WGN TV came out to visit and did a really nice overview of our business and bean to bar chocolate making! We are the Chicago area bean to bar chocolate maker. And Andrea is super nice! Mar 29, 2018 - The Chicago Reader did an article about our move, the new Speakeasy and the Kickstarter! It's really great. Check it out. Feb 21, 2018 - We were awarded 5 stars as one of the best chocolatiers in America and Master Chocolatiers! Feb 6, 2018 - Men's Journal recommends us for Valentine's Day chocolate! Dec 22, 2017 - We were featured briefly in a WGN segment about Illinois made products. 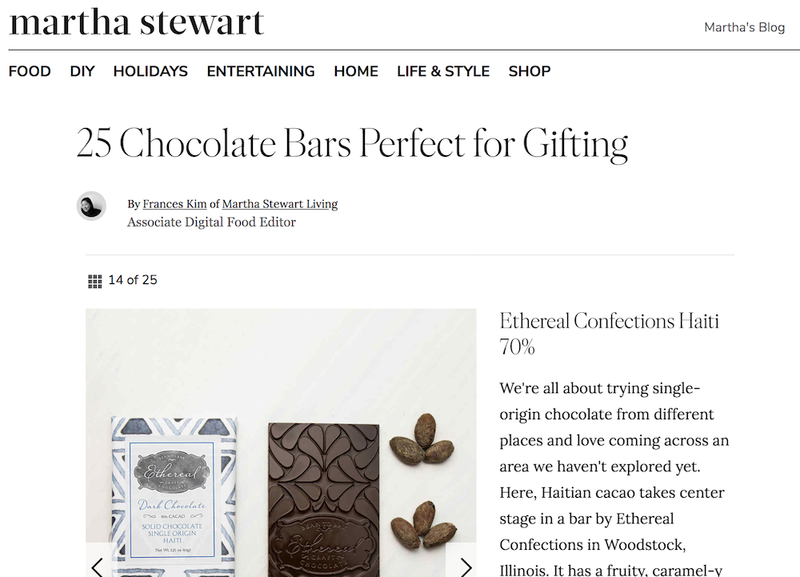 Dec 19, 2017 - We are featured in Martha Stewart's Holiday Gift Guide! Dec 18, 2017 - VoyageChicago did a profile on us! Oct 10, 2017 - A nice article about our sourcing activities recently in Ecuador, The Dominican Republic and Haiti. These were really interesting trips. As a result, we've brought in our first batch of single farm beans from Ecuador! Jul 3, 2017 - We were awarded Silver and Bronze awards for our spicy chocolates and vegan chocolates by the International Chocolate Salon! Try our award winning: Almond Nib Inclusion Bar, Vanilla Sea Salt Meltaway, Caramel Inferno truffle and Scorpion Pecan Inclusion Bar! JUNE 01, 2017 - Travel Illinois has put up a really nice page highlighting Ethereal! May 25, 2017 - Visit McHenry County made a really nice video about us! Click on the left to view! February 9, 2017 - We did a radio interview with Laure Redmond called Chocolate Love Affair. Click to give it a listen! March 7, 2016 - The Northwest Herald did an article on us focusing on our work with craft breweries to create beers infused with chocolate flavors. 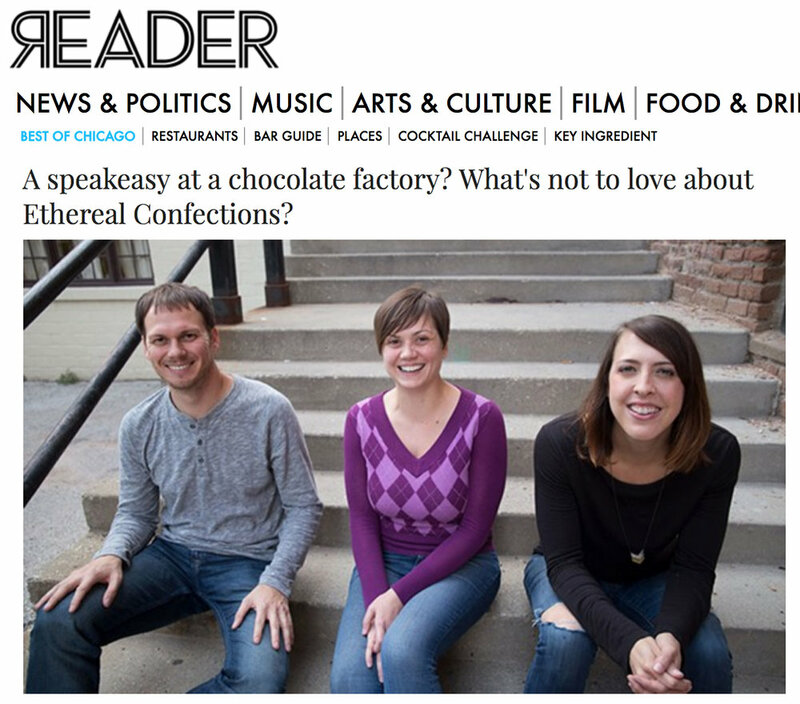 February 8, 2016 - The Chicago Tribune did a nice in-depth article about us and bean to bar chocolate. June 30, 2015 - Our Blood Orange & Vanilla Bean won silver! Aug 8, 2014 - Some very nice film students made a movie about us. We really love it. Click on the left to take a look! August 15, 2014 - ABC7 came out and did a story on us. There are some nice shots of everything in action! July 17, 2013 - A nice overview of our business in the Herald!